Kabir and his friend Architesh Prasad created a documentary for StudentCam 2018. Theme of the StudentCam 2018 was “THE CONSTITUTION & YOU”. They had to choose a provision of the U.S. Constitution and create a video illustrating why it’s important to them. There were 2985 entries from 46 states, as well as Washington DC, Taiwan and the United Arab Emirates. 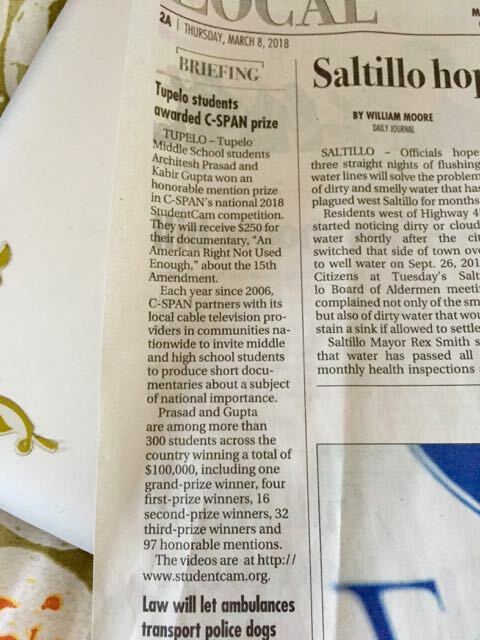 5,700 students participated in this StudentCam competition. Their documentary is the first movie amongst the Honorable mentions and they will receive $250 cash prize. Their entry is the only one from Mississippi that made it to Honorable mentions. We are so proud of them! 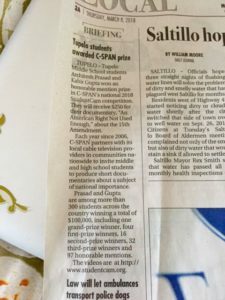 The article in the local newspaper identifies Kabir as a Tupelo Middle school student, however he is a 6th grader and homeschooled.